The Cloud Beast is known for being a tank that gives you the ultimate sub ohm experience! It holds a whopping 6mls of e liquid which allows the user to have plenty of their favorite juice to make it throughout the day. And if you are a cloud chaser you know how fast your e liquid can go and this tank makes vaping convenient and easy! 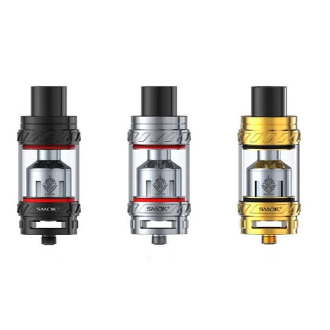 Unlike their previous models, Smok has designed this tank with 2 bigger adjustable air slots. The airflow control panel is located on the bottom of the tank and can be maneuvered this way and that at the users disposal. Another portion of the tank that features a size increase is the center heating air tube, which is now wider and longer for better ventilation. On top of the tank is a large Delrin drip tip which gives the user a bigger draw but also cools down the vapor while being channeled through it. Beneath the Delrin drip tip is your top cap that can be unscrewed for access to your refill slots. This Top fill method makes it very convenient and also helps avoid messy fills.